“A suspenseful dark fantasy saga. 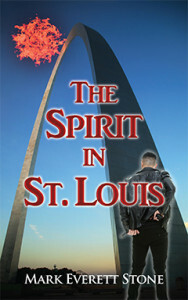 A balance between psychological intrigue, menacing chills and fierce resistance, The Spirit in St. Louis is a page-turner from cover to cover. Highly recommended!” Read more…. Mark has also written a novella in the series, Oil’s Not Well in Odessa. The audiobook versions of the From the Files of the BSI books are produced by Books in Motion. Mark’s first novel, Things to Do in Denver When You’re Un-Dead, won the second place Forward Literature Award for Humor and was on the shortlist of ForeWord Magazine’s debut fiction award, ForeWord Firsts. The Judas Line was a finalist in ForeWord’s Book of the Year Awards and earned a starred review in Publishers Weekly. However, the World Under never rests, and events force Kal back into action. A malevolent spirit occupies St. Louis’s Quint Building, and the team sent in to combat it disappears after their leader is driven to suicide. The BSI has no choice but to send in Kalevi Hakala and his team to solve the problem. As each of the individual members of Kal’s team is isolated and dumped into his or her private hell, Kal begins to wonder if he hasn’t finally met his match: the most powerful force the World Under has to offer. Born in Helsinki, Finland, Mark Everett Stone arrived in the U.S. at a young age and promptly dove into the world of the fantastic. Starting at age seven with The Iliad and The Odyssey, he went on to consume every scrap of Norse Mythology he could get his grubby little paws on. At age thirteen he graduated to Tolkien and Heinlein, building up a book collection that soon rivaled the local public library’s. In college Mark majored in Journalism and minored in English. Mark lives in California with his wife, Brandie, and their two sons, Aeden and Gabriel. Click here to find him on the Web. “Where to, boss?’ This came from Rat, who still looked mighty pale from popping a dead man’s eyeball into his mouth. To be honest, that freaked me out more than the shrieking gray/red orb that about busted my eardrums. Got to give the man credit; he might be a pervert, but he had balls. No pun intended. Keeping Dove shut up turned out to be harder than I thought. “That’s crazy,” she blurted. A knife through both ears and into my brain, fire along my nerves and needles in my eyes—pain like I haven’t felt since a crazed cop in San Francisco took a drill to my kneecaps. I hit the deck because my legs refused to respond. Distantly I heard rounds firing off and I hoped whoever it was hit the ugly orb that once again hung over us, flinging gouts of reddish mist that floated like cotton candy in the air. All I could think was not again. The screaming grew louder and louder, and I added my own shrieks because this was worse than last time—worse than anything else. Before I passed out, all I saw was red and gray.